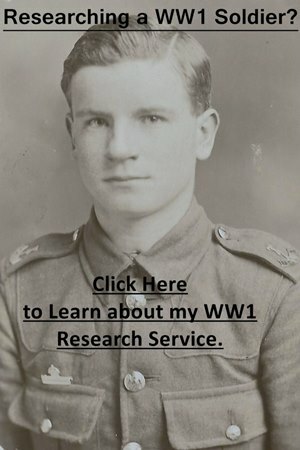 What Information does Soldiers Died in The Great War 1914-1919 Contain? Name: Usually a full name is provided but sometimes only initials. Regimental Number: This will be the regimental number held by the soldier when they died. Regiment and Unit: Eg. 1st Battalion, Hertfordshire Regiment. Theatre of War: Egyptian, Western European Theatre etc. Of the information recorded, cause of death is very useful as soldiers often died of wounds many days after they had been wounded. If you’re researching a soldier who died I would recommend checking Soldiers Died in The Great War 1914-1919 straight away to see if they were killed in action on that particular day or died of wounds or another cause (usually disease). Though bare in mind that a soldier could have died of wounds on the day he was wounded. I would then recommend looking at the unit’s war diary for more information about what the unit was doing on the day a soldier died. If the cause of death was recorded as “Died” then its possible they were killed in an accident and fatal accidents are usually recorded in a war diary. Many soldiers drowned while bathing or were killed in railway accidents during the war. Soldiers Died in the Great War 1914-1919 is available to search on Ancestry and FindmyPast. I prefer FindmyPast’s search engine but if you want to be thorough when researching a soldier you will need to join both sites. Fortunately, they both have free trial periods and if you’re only researching a couple of soldiers you’ll be able to get all relevant documents during this time. If you’re interested in a particular regiment and would like to purchase a hardback copy then I can recommend searching Ebay. Due to the digitization of the records by the major genealogy sites you can pick up the volumes quite cheaply.